Daily complexities and expenses in everyday life can push us to make sacrifices in comfort and mobility for practicality’s sake. You may know what’s right for you, but you end up settling with what’s available instead. That compromise ends now, as Hyundai Asia Resources, Inc. the official distributor of Hyundai passenger cars and commercial vehicles introduces the right one to help you rule your journey: the all-new Hyundai Reina. 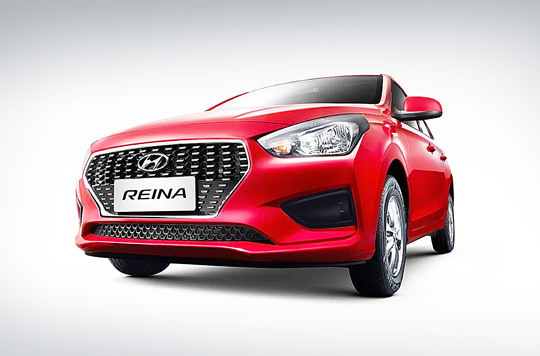 With the Reina, you can celebrate your new beginnings as a motorist with style, as this subcompact stunner is fashioned with Hyundai’s Fluidic Sculpture 2.0 design DNA that gives it urban elegance reminiscent of the Hyundai Modern Premium pedigree. Reina is a sedan that opens up to a space that comfortably fits up to five (5) occupants, and has ample wheelbase measuring 2,570mm that gives you and your passengers just the right room for comfort. Add to this Reina’s generous trunk space that can store up to 475 liters of cargo and you’re set for road trips with room to spare for passengers and gear alike. Under the hood of the Hyundai Reina is a 1.4L gasoline engine with dynamic power of 95ps for quicker maneuverability in and around the city. It’s mated to either a 5- speed manual transmission or a 4-speed automatic transmission, offering a more versatile and convenient driving experience for first-time and city drivers alike. Though it’s your practical, everyday car, the Hyundai Reina is ready with the more important safety features that you don’t usually find in most subcompact cars. It’s equipped with dual airbags that provide significant occupant protection for both driver and front passenger, and an Anti-lock Braking System that lets you have better control of your driving maneuvers during slippery road conditions. Indeed, the Reina has put together the right elements of design, convenience, space, performance, and safety to bring excitement to your daily travels. Starting at P598,000, rule your road and your journey today by making Hyundai Reina your right choice.